When I first became interested in photography, there was one thing that I wanted to take a good photograph of - a waterfall. I had seen some inspiring waterfall photographs in magazines and I longed to reproduce the same quality results. I can recall vividly, standing at the side of a road in Wales on a bright sunny day, with the camera pointed at a small spout of water. When the slides came back from the lab (yes you had to send something called film off to a lab to be processed) I was so excited to see a long exposure effect that I completely ignored the other problems with the image. Even today I love to shoot waterfalls so I thought it would be a nice idea to share a few tips for photographing waterfalls. Tip 1 – Select the best waterfalls. Whilst it may be fun to shoot waterfalls, not every waterfall is as photogenic as others. My little water spout in Wales would never have qualified as a photogenic subject. If you are heading out with the intention of photographing waterfalls, try to plan your day around the ones that make the best subject matter. 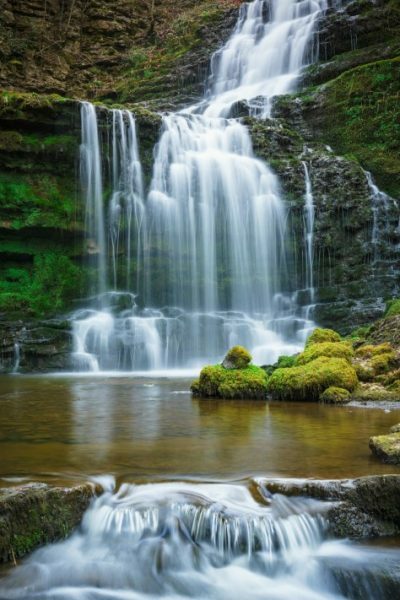 One example of a waterfall that I like to visit is Janet’s Foss in Malham. It’s a lovely location and in spring the area turns a vivid green with the wild garlic (it does smell a bit though). Despite my enjoying visiting the location, the waterfall doesn’t offer much in the way of photographic possibilities. Often you are forced to shoot the falls head on and the cascade of water doesn’t really cascade, as you can see in the following photograph. Contrast this with a waterfall such as Scalber Force (shown at the end of this article) which is very photogenic. It can also offer many variations in terms of composition and close up work. Not all weather conditions are ideal for photographing waterfalls and in fact some conditions are terrible. Sunny conditions for example can create very high contrast scenes, especially if the waterfall is partially hidden by trees in in leaf. These high contrast conditions can easily turn some areas black whilst causing light areas such as the water to turn white. These areas can appear very ugly in the final image and are difficult to correct. Better conditions are often overcast or even wet days where the lighting on the waterfall will be more even. You will find your camera can cope much better with this lower contrast range allowing you to retain detail in the shadow areas and water highlights. The above image is an example of a waterfall photograph captured on a cloud day. 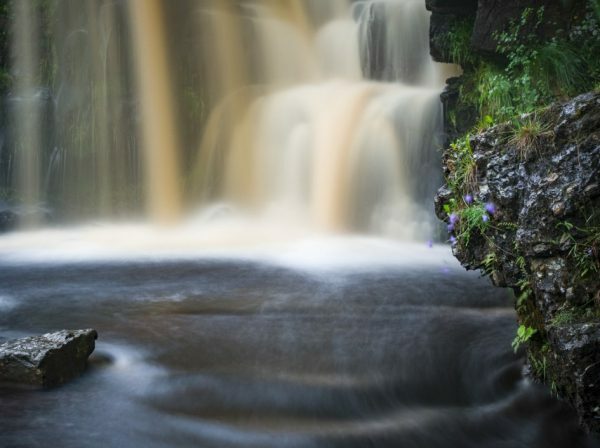 This is lower East Gill Force in Keld, North Yorkshire which is shrouded by trees. In Summer when the trees are covered with leaves, the scene can become quite dark. If there were any sun breaking through onto the water, it’s likely this would send the contrast range well beyond what the camera could handle. The immediate temptation when faced with a waterfall location is to take a picture of the entire waterfall. This is fine but you should also spend time exploring the scene for less obvious and more creative composition. You may find that part of the waterfall, rather than the full waterfall will make for a better subject. Alternatively, perhaps focussing on the water going over the lip of the falls or the spray created where the water hits the rocks at the bottom of the falls would create powerful images. The waterfall doesn’t even need to be the main focus of the image as in the above photograph of East Gill Force. Here the waterfall has been used as a backdrop to the main subject to give a sense of location. A polarising filter will reduce the glare created when light reflects off a wet surface such as surrounding rocks or vegetation. It’s this reflection of light that can causes reduced saturation and acts as a distraction from the main subject. Be sure to watch out for over polarising your image though. It’s often advisable to find the maximum effect and then back off a little. The filter can also be used to reduce the reflection from the surface of the water around the base of the waterfall. Look back to the image of Janet’s Foss at the start of this article and notice you can see through the surface to the rocks below the water. This effect was achieved using a polarizing filter. A further feature of the polarising filter is that it will reduce the amount of light reaching the camera sensor. Typically, there is a reduction of around 3 stops of light. This can provide a fourfold increase in the length of a shutter speed. A shutter speed of 1/60” would half then half again to 1/15”, something we will touch on in the next tip. Typically, many small waterfalls will appear most appealing where a slow shutter speed has been used to blur the motion of the water. This blurring tends to produce a softening effect which can imply a feeling of tranquillity. 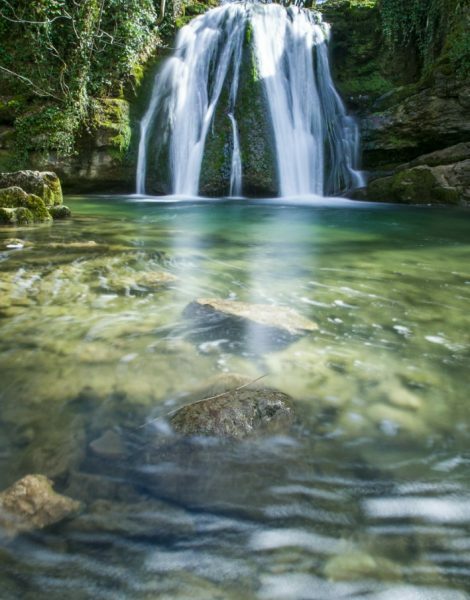 Longer shutter speeds can be achieved through the use of Neutral Density (or ND) filters. These are placed in front of the lens and reduce the level of light reaching the camera sensor or film. This creates a longer shutter speed to produce the correct exposure. ND filters are sold in varying strengths depending on how much light they cut out and so how much they will slow the shutter speed. For example, a 1 stop ND filter may be labelled as X2 as it will increase the shutter duration by a factor of 2 (1/60” becomes 1/30”). A two stop filer is X4 and a 3 stop X8 etc. If you combine these filters with a polarising filter (see Tip 4) you can usually extend shutter durations into seconds, especially in dark, shaded conditions. In bright conditions you might find the extreme ND filters such as the 6 stop and 10 stop useful. Typically, these will produce a very “milky” water effect that often isn’t as appealing as water with more structure. The shutter speed required to achieve a nice level of structure in the water will depend on the amount of water passing over the falls and speed its falling. It’s best to experiment and review the results from some initial shots to determine this. By contrast, some larger waterfalls are very powerful and you might want to emphasise this effect. Here you might want to consider using a very fast shutter speed to freeze the motion of the water rather than blurring and softening it. Remember, different shutter speeds will create different effects which can give rise to different feelings in the viewer. These aren’t the only tips that will help you when photographing waterfalls but when followed, they will help you achieve successful waterfall photography. If you would like to know more about using filters in landscape photography see my guide in the Lenscraft Creative Store.